The last few decades have brought several new challenges for manufacturing companies. Technology and improvements in transportation of goods has enabled companies to source parts globally. This has also resulted in more manufacturers having entered the market place. Competition for business is fierce. Manufacturing companies in the developing world market are able to offer products at lower prices. In an effort to maintain business and achieve growth many manufacturers are continually developing new products to widen their customer base. They must be quick to market with a high quality product or be left behind. Properly planned and implemented Design for Manufacturing and Assembly (DFMA, DFM/A or DFM/DFA) processes are enabling companies to develop high quality products in less time at lower production costs. Higher quality at a lower cost usually means more sales and greater customer loyalty. DFMA is a combination of two methodologies, Design for Manufacturing (DFM) and Design for Assembly (DFA). This combination enables a product design to be efficiently manufactured and easily assembled with minimum labor cost. Through the use of DFM/A, a company can prevent, detect, quantify and eliminate waste and manufacturing inefficiency within a product design. DFM/A is a break from tradition. With DFM/A, the Design and Manufacturing Engineers work together as a team in developing the product’s manufacturing and assembly methods simultaneously with the design. Conventionally, the design engineer designs the product then hands the drawings to manufacturing who then determine the manufacturing and assembly processes. Many engineers automatically separate the two into DFM and DFA since they have been defined separately for several years. For effective application of DFM/A the two activities must work in unison to gain the greatest benefit. The DFMA methodology allows for new or improved products to be designed, manufactured and offered to the consumer in a shorter amount of time. DFM/DFA helps eliminate multiple revisions and design changes that cause program delays and increased cost. With DFM/A the design is often more comprehensive, efficient to produce and meets the customer requirements the first time. A shorter total time to market frequently results in lower development costs. The application of the DFMA method results in shorter assembly time, lower assembly cost, elimination of process waste and increased product reliability. Many companies today are integrating the DFM and DFA practices through design and manufacturing teamwork. The Design for Manufacturing (DFM) and Design for Assembly (DFA) techniques are two different classifications. DFM techniques are focused on individual parts and components with a goal of reducing or eliminating expensive, complex or unnecessary features which would make them difficult to manufacture. DFA techniques focus on reduction and standardization of parts, sub-assemblies and assemblies. The goal is reduce the assembly time and cost. But if you think about it, they must be integrated to prevent one from causing negative effects on the other. The designer may seek to combine parts to reduce assembly steps, quantity of parts and hardware. If the resulting parts are difficult or expensive to manufacture then you have gained nothing. We must work together to accomplish both goals. 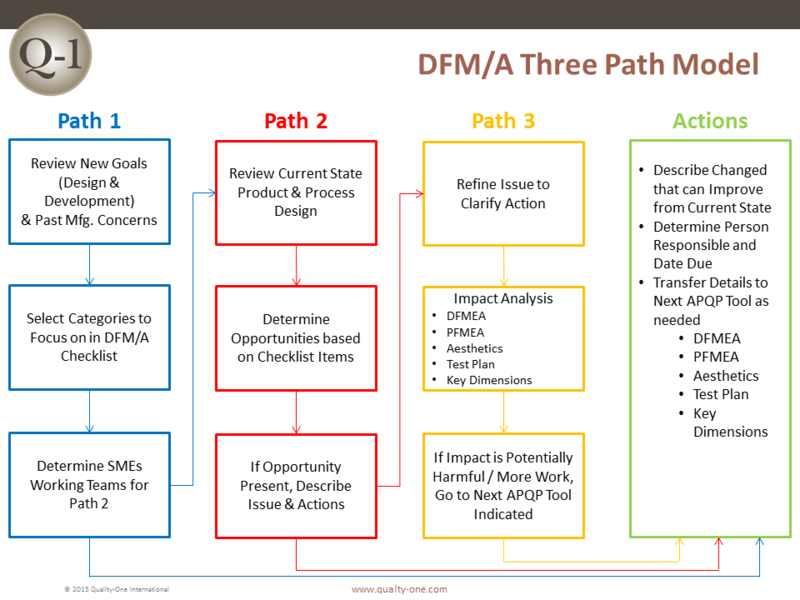 The principle goals for simultaneous DFM/A are detailed below. Can the part be manufactured using the same material as other parts? How does the part in question move in relation to other moving parts? Can the parts be combined without need for any special process or tooling? If combined with another part how does that impact ease of possible disassembly? If combined with other parts how would it impact ease of manufacture? Through reduction of component part quantities you also reduce the amount of hardware and the number of assembly steps required. The likelihood of assembly errors are subsequently reduced in relation to the reduction in assembly steps. Design reviews with members of process engineering, quality control and the fabrication team are beneficial when possible. In most cases the meetings result in a few changes to the design that increase utilization of existing tools or improve machine utilization, preventing the need for capital expenses for special tools. In addition, the meetings improve knowledge transfer of design intent to all levels of the organization. The designer should become familiar with the process capabilities of any equipment required for the manufacture of the part. In addition, review current process controls to assure that any Special Characteristics (KCCs or KPCs) can be monitored. Avoid tight tolerances beyond the proven capability of the manufacturing processes. Determine if improved process capabilities are required early in the design or program schedule to allow time for any process improvement activities and the establishment of proper process controls. In addition, the designer should evaluate any interactions between component parts to avoid tolerance “stack-up” issues. Parts should be dimensioned in the center of the tolerance range to allow for the greatest variance and still remain a functional conforming part. In addition, avoid one sided tolerances and use surface finish callouts only when required, as that may result in unneeded additional part cost. Chamfered or radius corners should both be allowed if it will not change the function of the part. This will permit production control to route the part to different machines based upon demand. Whenever possible the design should incorporate common parts and materials, including parts already in use in other similar products or assemblies. Common parts and materials help minimize inventory levels and will result in lower cost and higher quality. One of the most successful new product introductions Quality-One has been a part of incorporated 50% carry over / common parts from a similar product. The new content of the design was greatly reduced therefore the design risk was reduced. In addition, the learning curve of the assembly team members was reduced. Designers should look for ways to mistake proof their designs, making the proper assembly of mating parts instantly recognizable and impossible to assemble incorrectly. By the addition of tabs and slots, asymmetrical holes and interference features the parts can be made difficult or impossible to assemble in reverse or oriented improperly. The designer should also avoid the need for any special adjustments or alignments in the assembly process. With enough thought put into the design of an assembly many of the parts can be made mistake proof. The designer should also consider how the part or assembly could be inspected for quality purposes. For some parts, conformance to design requirements may be verified with basic go / no-go tools. In other cases the parts may need to be measured and the designer should indicate any key or critical to quality dimensions or features. Drawings should consistently indicate the proper origination when fed into a process. An example would be how parts are oriented into a brake press for either bend up or bend down operations. The designer should avoid use of parts that can easily become tangled in the container or that are difficult to pick up and handle. This slows production and can increase waste due to damaged, dropped or lost parts. When possible design parts that are symmetrical along both axis. This allows for ease of fabrication and correct assembly. Parts should be designed so that they may be easily grasped, oriented and placed in an assembly or weld fixture. Examples would be parts with flat, parallel surfaces that are easily picked-up and assembled by the operator. Another instance to think about could be if the part is picked up by a suction or magnetic gripping device when used in a “pick and place robot” application. Always avoid parts with sharp edges, burrs or points. Use radii and chamfers when possible to reduce chance of operator injury. Avoid heavy or oversized parts that will require lifting devices or may increase worker fatigue and risk of injury. Always consider assembler and operator safety in all designs. When designing a workstation it is good practice to plan for minimum worker travel time. Minimize the distance to access and move a part or assembly. A good rule of thumb is that most components should be within two steps from the point of assembly and common hardware and tools within easy reach. Incorporate simple patterns of movement in your assembly process and minimize steps. If that is not possible, consider breaking it down into logical sub-assemblies. Avoid multiple set-ups or re-orientation during the assembly process. This creates wasted movement and time. Parts should incorporate lead-in features and chamfers. This allows for easier insertion of pins or bolts. Design the product so it may be assembled from the bottom up using gravity to your advantage. Always allow for adequate tool clearance and assure the operator can see what they are assembling, with no hidden interfaces or attachment points. Limit the variety of hardware sizes and configurations in an assembly. This will help prevent incorrect hardware being used or used in the wrong location. Example: One design recently observed utilized one size and type of self-tapping screw for every sub-assembly and the parent assembly. Only one type of hardware was required in the production cell. Threaded bolts, washers and nuts are time consuming to assemble. If they are required, consider weld nuts or nuts that are captured in the part. The designer must look at alternative methods of attachment. In addition, the dealer can stock most sold items for fast delivery to customer. Customized combinations of the modules can be delivered to the site and installed quickly. Increased process throughput or efficiency. Improved quality or more predictable process results. Consistency in the process output. Something else to consider is the fact that automated production can require less flexibility in design than manual production. The product must be designed so that it can be handled with automated equipment like gripping or magnetic lifting and placement equipment. Avoid any requirements for gripper / tool change. You must also use self-locating parts, simple parts-presentation devices and avoid the need for clamping or securing parts during assembly or processing. Design for Manufacturing and Design for Assembly are both important and often interwoven and referred to simply as DFM/A. The primary goal is to design a product and process to be as efficient as possible. Whether a product is assembled by machines or by operators, the designer and the mechanical engineer should work together to ensure that labor cost, overhead and materials are reduced as much as possible. We should always strive to produce a quality product the first time and every time and Design for Manufacturing and Assembly can help! When DFM/A is applied, your company can run at higher profit margins, with higher quality and at a greater level of efficiency. Quality-One offers Quality and Reliability Support for Product and Process Development through Consulting, Training and Project Support. Quality-One provides Knowledge, Guidance and Direction in Quality and Reliability activities, tailored to your unique wants, needs and desires. Let us help you Discover the Value of DFM/DFA Consulting, DFM/DFA Training or DFM/DFA Project Support.